Travel through open farmland vistas that change with the seasons. Yellow fields of canola and green fields of wheat, oats or barley in winter and spring give way to the golden hues of early summer and the patchwork quilt of ploughed fields in the autumn. You will see that the Wheatbelt’s primary enterprise is the growing and transport of grain. 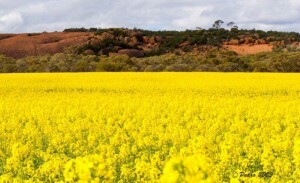 Broad acre dry land farming is the backbone of the Central Wheatbelt. 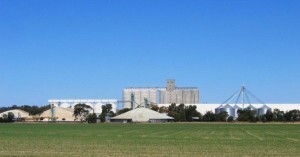 The CBH Grain Storage and Transfer Depot at Merredin is capable of storing up to 600,000 tonnes of grain while every town has its wheat silos and rail network. Research into wheat varieties, agronomy, and agricultural pests and diseases is a continuing process. The 100 year old Dryland Research Institute at Merredin operated by depatment of Primary Industries and Regional development, is the major agricultural research organisation in the region. The region holds many heritage sites and museums that illustrate the evolution of the grain industry, the machinery used and the dedication of generations of farmers and railway people in establishing the efficient industry there is today. A drive through the industrial areas of Merredin and other country towns will illustrate the industries that rely on the growing of grain. These include silo manufacturing, machinery sales, fabrication and machinery servicing. One of the largest machinery field days in the State, The Dowerin Field Day is held in August each year. 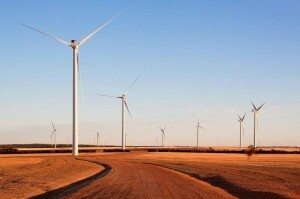 Between Merredin and Burracoppin you can drive through one of the largest wind farms in Australia. Collgar Wind Farm is a site of 18,000 hectares and contains 111 turbines which generate enough power to supply 125,000 homes. It will displace 700,000 tonnes of carbon which is equivalent to taking 160,000 cars off the road each year. Visitors are invited to stop at the interpretive shelter located on Bulls Head Road. the pioneer wells along the way. The Edna May mine at Westonia was first opened in the early 1900’s and has been an active mine several times since. It is currently a fully operational gold mine, having reopened in 2010. The mine lookout at the Edna May provides spectacular views of the open cut mine and mill in operation. A number of the old prospecting areas including Westonia and several Yilgarn fields at Bullfinch, Koolyanobbing and Marvel Loch are still operating with an additional employment base from some Wheatbelt communities.